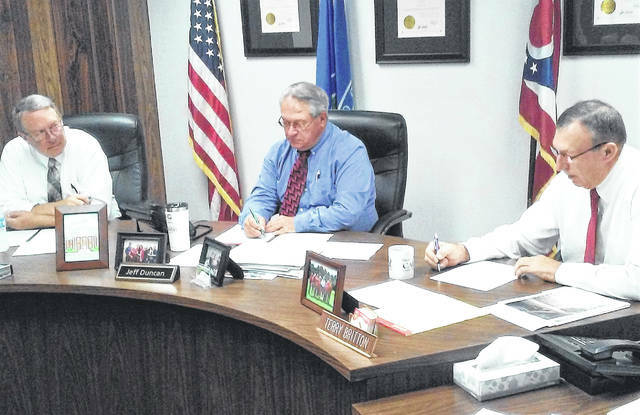 At Wednesday’s meeting, Highland County commissioners, from left, Gary Abernathy, Jeff Duncan and Terry Britton, agreed to continue with their efforts at securing a Rocky Fork Lake area grant. The Highland County Board of Commissioners on Wednesday agreed to cautiously continue efforts to secure a more than $800,000 federal economic development grant for the Rocky Fork Lake area after nearly giving up last week. As previously reported, the commissioners last week said they were going to let the application deadline for the grant expire, but received word the next day that the application deadline had been extended by the Byrne Criminal Justice Innovation Program, the division of the Department of Justice that awarded the grant. Commissioner Jeff Duncan told those at the commissioners’ weekly meeting, where several members of the Rocky Fork Community Alliance were present, that fellow commissioners Terry Britton and Gary Abernathy spoke with Department of Justice officials by phone Tuesday. Abernathy said former Commissioner Shane Wilkin, now state representative of the 91st District, joined commissioners on the call. “We wanted to pose some questions to them since we had some consultations with people who have had experience writing grants,” he said. Abernathy said that from the beginning of the grant process, the DOJ has strictly maintained that only the commissioners office or county employees can be involved in administrating the grant. The Rocky Fork Lake Area Safety and Advancement Project began with a proposal from the Turning Point Applied Learning Center, with its then-director LuAnn Winkle. Abernathy stressed that the original grant proposal specifically stated that Winkle would be the site administrator and that Turning Point would manage the grant. “Almost as soon as they approved it, they turned around and said Turning Point can’t have anything to do with it, and yesterday on the phone, it was the first time in Shane’s memory as well, they actually came out and admitted making that error,” Abernathy said. Britton said that in the phone call the DOJ was advised that the commissioner’s office didn’t have the staff to manage the grant, and that different scenarios were mentioned to see if other individuals would be qualified and approved. One thing that concerned Britton was that the clock on the extension began running Oct. 1. Britton said Wilkin spoke with him by phone Tuesday night and indicated he would be in contact with both Senator Rob Portman and Congressman Brad Wenstrup’s offices, both of whom have agreed to write letters to the DOJ asking them to lengthen the extension or grant a second one. Another point of contention, Britton said, was the sheriff’s contract, because under its terms Highland County Sheriff Donnie Barrera won’t be able to assign three new deputies to the lake region which was specified in the grant. The commissioners said they are committed to moving forward with a locally managed plan for economic development at Rocky Fork Lake in the event the grant funds fail to materialize. Commissioner Jeff Duncan said the commissioners have been meeting in the past week with individuals around the county who have experience dealing with grants. Duncan said the process has been aggravating. Another facet of the lake improvement, which was a major sticking point in the original proposal, was the establishment of a land bank to address the issue of blighted properties. Duncan said commissioners will meet with Clinton County officials for more information on the Clinton County land bank. “One of our goals for 2019 is to have the land bank in place,” he said. Britton stressed the need to ensure that funding for the elements of the grant will continue into the future. Britton went to on assure the members of the lake alliance that commissioners are not giving up on the grant, confirming that they will continue to work through the process of dealing with the federal government. One of the lake alliance members, Becky Basford, a longtime Highland County resident and a federal grant writer who has offered her assistance, encouraged commissioners to stay the course. She went on to say that in her experience, it isn’t surprising to have to wait months or even a year when dealing with agencies like the Department of Justice. Lori Morris is a board member of the Rocky Fork Community Alliance and expressed optimism about the grant.